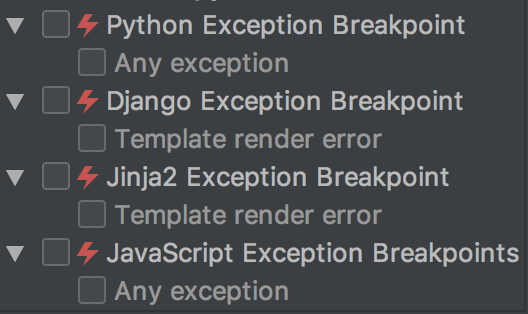 What are exceptions? Judging by their name it is an entity representing some exceptional situation that happens inside your program. 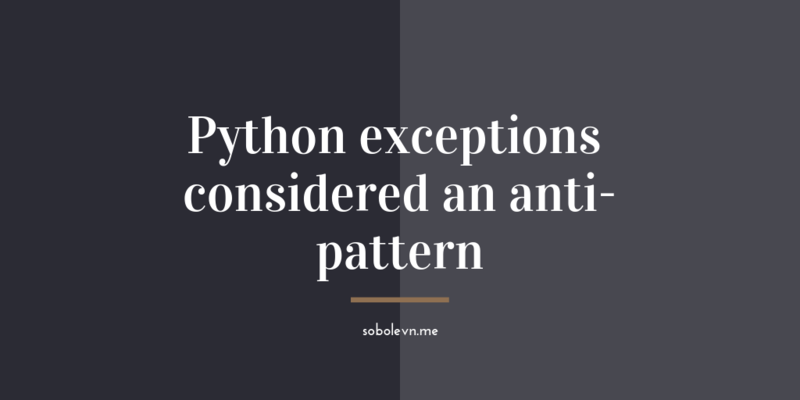 You might be wondering how do exceptions are an anti-pattern and how does this relate to typing at all? Well, let’s find out! First, we have to prove that exceptions have drawbacks. Well, it is usually hard to find “issues” in things you use every day because they start to look like “features” to you at some point. Let’s have a fresh look. There are two types of exceptions: “explicit” that are created with raise keyword right inside the code you are reading and “wrapped” that are wrapped inside some other functions/classes/methods that you are using. Wait, did you get it? print will never be actually executed. Because 1 / 0 is an impossible operation and ZeroDivisionError will be raised. So, despite your code is type safe it is not safe to be used. You still need to have a solid experience to spot these potential problems in a perfectly readable and typed code. Almost everything in python can fail with different types of exceptions: division, function calls, int, str, generators, iterables in for loops, attribute access, key access, even raise something() itself may fail. I am not even covering IO operations here. And checked exceptions won’t be supported in the nearest future. Hey, but we always have except cases just for this kind of situations. Let’s just handle ZeroDivisionError and we will be safe! Now we are safe! But why do we return 0? Why not 1? Why not None? And while None in most cases is as bad (or even worse) than the exceptions, turns out we should heavily rely on business logic and use-cases of this function. What exactly do we divide? Arbitrary numbers? Some specific units? Money? Not all cases can be covered and easily restored. And sometimes when we will reuse this function for different use-cases we will find out that it requires different restore logic. So, the sad conclusion is: all problems must be resolved individually depending on a specific usage context. There’s no silver bullet to resolve all ZeroDivisionErrors once and for all. And again, I am not even covering complex IO flows with retry policies and expotential timeouts. Maybe we should not even handle exceptions in-place at all? Maybe we should throw it further in the execution flow and someone will later handle it somehow. Ok, now we will hope that someone else will catch this exception and possibly handle it. For example, the system might notify the user to change the input, because we can not divide by 0. Which is clearly not a responsibility of the divide function. Now we just need to check where this exception is actually caught. By the way, how can we tell where exactly it will be handled? Can we navigate to this point in the code? Turns out, we can not do that. There’s no way to tell which line of code will be executed after the exception is thrown. Different exception types might be handled by different except cases, some exceptions may be suppressed. And you might also accidentally break your program in random spots by introducing new except cases in a different module. And remember that almost any line can raise. We have two independent flows in our app: regular flow that goes from top to bottom and exceptional one that goes however it wants. How can we consciously read code like this? Only with a debugger turned on. With “catch all exceptions” policy enabled. Exceptions are just like notorious goto statements that torn the fabric of our programs. """Fetches UserProfile dict from foreign API.""" And the list goes on and on! There are so maybe potential problems with these three lines of code, that it is easier to say that it only accidentally works. And normally it fails with the exception. Write except Exception: pass everywhere. That’s as bad as you can imagine. Don’t do it. Return None. That’s evil too! You either will end up with if something is not None: on almost every line and global pollution of your logic by type-checking conditionals, or will suffer from TypeError every day. Not a pleasant choice. Write special-case classes. For example, you will have User base class with multiple error-subclasses like UserNotFound(User) and MissingUser(User). It might be used for some specific situations, like AnonymousUser in django, but it is not possible to wrap all your possible errors in special-case classes. It will require too much work from a developer. And over-complicate your domain model. You can use container values, that wraps actual success or error value into a thin wrapper with utility methods to work with this value. That’s exactly why we have created @dry-python/returns project. So you can make your functions return something meaningful, typed, and safe. Let’s start with the same number dividing example, which returns 0 when the error happens. Maybe instead we can indicate that the result was not successful without any explicit numerical value? Now we wrap our values in one of two wrappers: Success or Failure. These two classes inherit from Result base class. And we can specify types of wrapped values in a function return annotation, for example Result[float, ZeroDivisionError] returns either Success[float] or Failure[ZeroDivisionError]. What does it mean to us? It means, that exceptions are not exceptional, they represent expectable problems. But, we also wrap them in Failure to solve the second problem: spotting potential exceptions is hard. Now you can easily spot them! The rule is: if you see a Result it means that this function can throw an exception. And you even know its type in advance. Moreover, returns library is fully typed and PEP561 compatible. It means that mypy will warn you if you try to return something that violates declared type contract. # => error: incompatible type "str"; expected "float"
# => error: incompatible type "int"; expected "ZeroDivisionError"
How to work with wrapped values? Now you can just concentrate on correct execution flow and be sure that failed state won’t break your program in random places. And you can always take care of a failed state and even fix it and return to the right track if you want to. It means that “all problems must be resolved individually” practice is the only way to go and “execution flow is now clear”. Enjoy your railway programming! But how to unwrap values from containers? Wait, what? You have promised to save me from exceptions and now you are telling me that all my .unwrap() calls can result in one more exception! How not to care about these UnwrapFailedErrors? """Returns an UserSchema for valid input, otherwise a Failure.""" """Creates an Account for valid UserSchema's. Or returns a Failure.""" """Create an User instance. If user already exists returns Failure.""" """Can return a Success(user) or Failure(str_reason).""" And this will work without any problems. It won’t raise any exceptions, because .unwrap() is not used. But, is it easy to read code like this? No, it is not. What alternative can we provide? @pipeline! Now it is perfectly readable. That’s how .unwrap() and @pipeline synergy works: whenever any .unwrap() method will fail on Failure[str] instance @pipeline decorator will catch it and return Failure[str] as a result value. That’s how we can eliminate all the exceptions from our code and make it truly type-safe. And we can see that the first one with @safe is way more readable and simple. """Single responsibility callable object that fetches user profile.""" #: with any other http library (or even a custom service). “Exceptions are hard to notice”. Now, they are wrapped with a typed Result container, which makes them crystal clear. “Restoring normal behavior in-place is impossible”. We now can safely delegate the restoration process to the caller. We provide .fix() and .rescue() methods for this specific use-case. “Execution flow is unclear”. Now it is the same as a regular business flow. From top to bottom. “Exceptions are not exceptional”. And we know it! We expect things to go wrong and are ready for it. Obviously, you can not write all your code this way. It is just too safe for the most situations and incompatible with other libraries/frameworks. But, you should definitely write the most important parts of your business logic as I have shown above. It will increase the maintainability and correctness of your system.